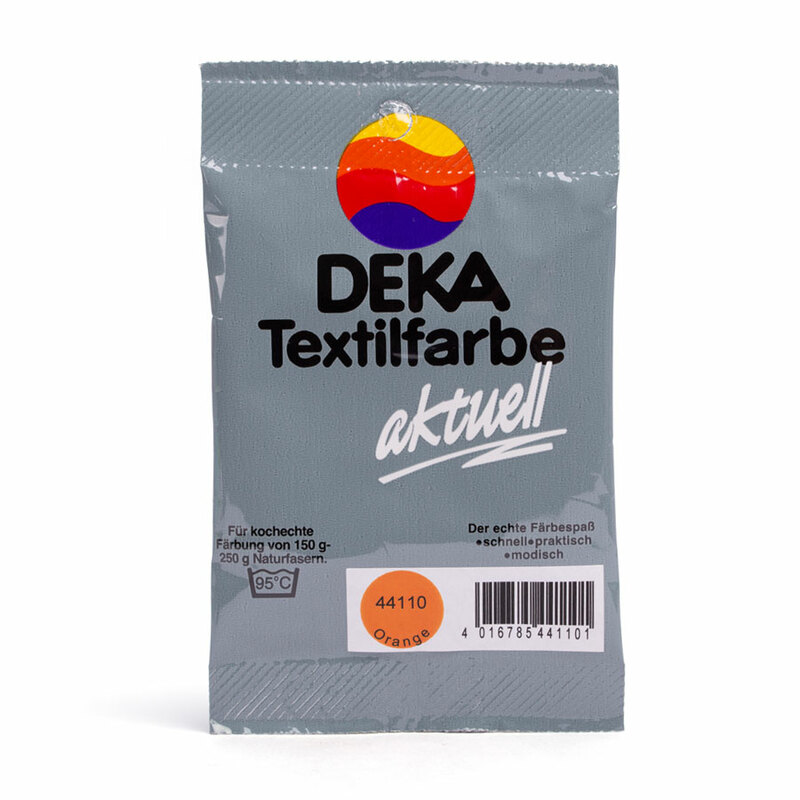 Product information "DEKA 'aktuell' Textile Powder Dye - 10g"
DEKA 'aktuell' is a very colour intensive dye for machine or hand dyeing, suitable for silk and all natural fibers like cotton, linen, batist, ramie, viscose and wool. You will achieve very even results and the fabric will be light fast and boil proof. All shades can be mixed. The colour 'black' is particularly intensive! DEKA 'aktuell' is a reactive colour, i.e. it works only with a reactive agent. Without reactive agent the colour cannot be fixed and the intensity of the pigments does not fully show! Reactive colours can also be used for dyeing at low temperatures (40°C). • The content of the pack (10g of dye) will suffice for 150g (full tone) to 250g (quarter tone) of fabric weight. • Dye temperature is 30°-60°C, depending on fabric type. • Dye time: 30 - 60 minutes, depending on colour depth (black or dark blue can be left for 3 hours or overnight in the dye liquor for a very deep dye). As the colour tones do not show well on the screen, it is best to refer to the RAL colour chart - we carry the original RAL colour chart in our web shop. Softener is also a finishing and can influence your dye result if not rinsed. If you want to dye silk you only need 10g of reactive agent 'aktuell' and instead of salt you should use 125ml of vinegar essence. With DEKA 'aktuell' textile dye you can very easily tie dye yourself - as shown on Youtube (just click on 'Tie-Dye') - and which is very popular in the U.S.A.
You can also fill the colour, which you have previously dissolved in 500ml of water, in a plastic bottle with a nozzle and spray it directly on the fabric. This is much cheaper than buying liquid dye. Wash bottles are also available in our shop. • In our blogpost: FAQs about dyeing with textile dyes we have answered many questions about the subject of 'Dyeing'. 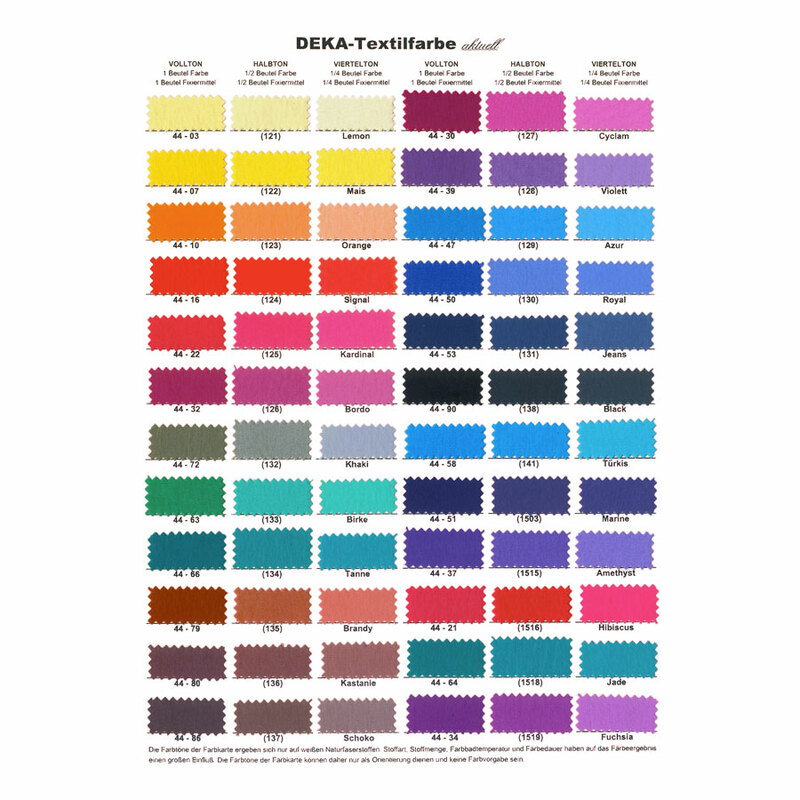 Related links to "DEKA 'aktuell' Textile Powder Dye - 10g"
The following instructions are for use of 10g of DEKA Textile Dye 'aktuell' and 20g of DEKA Textile Dye 'aktuell' reactive agent for 150-250g fabric weight. Dyeing temperature: 30°C-60°C, depending on fabric. Dyeing time: 30-60 minutes, depending on colour depth. The fabric should float loosely in the dye lot and always be fully immerged. 1. Fabric must be finish free and stain free (softener is also a finish). To remove finish completely we recommend DEKA TextilFit. 2. Dissolve dye thoroughly in 1/2 liter of hot water. 3. Fill a large plastic container with 3 liters of hot water, dissolve 150g of kitchen salt while stirring and add the prepared dye solution. 5. Dissolve DEKA reactive agent (20g) thoroughly in 1/2 liter of hot water. Beware: when dyeing silk use only half the amount of reactive agent but the same amount of water! After 5 minutes dyeing add the dissolved reactive agent slowly stirring to the dye bath. Then keep moving and shifting the fabric well in the dye bath, all the time while dyeing. Results from dyeing are dependent on the amount of powder in the dyebath, the amount of dyeing time, the temperature of the dyebath, and the fabric used, as well as other factors. 6. Rinse the fabric thoroughly after dyeing until the water runs clear. Then wash using a mild detergent in the washing machine at gentle cycle at 30°C. Please pay attention to our technical sheets and folders for detailed instructions - also for dyeing in the washing machine. Avoid skin contact with concentrated dye. Allergic reactions may occur in rare cases. Wear rubber gloves. Do not inhale dye. Keep out of the reach of children. In case of eye contact rinse immediately and thoroughly. 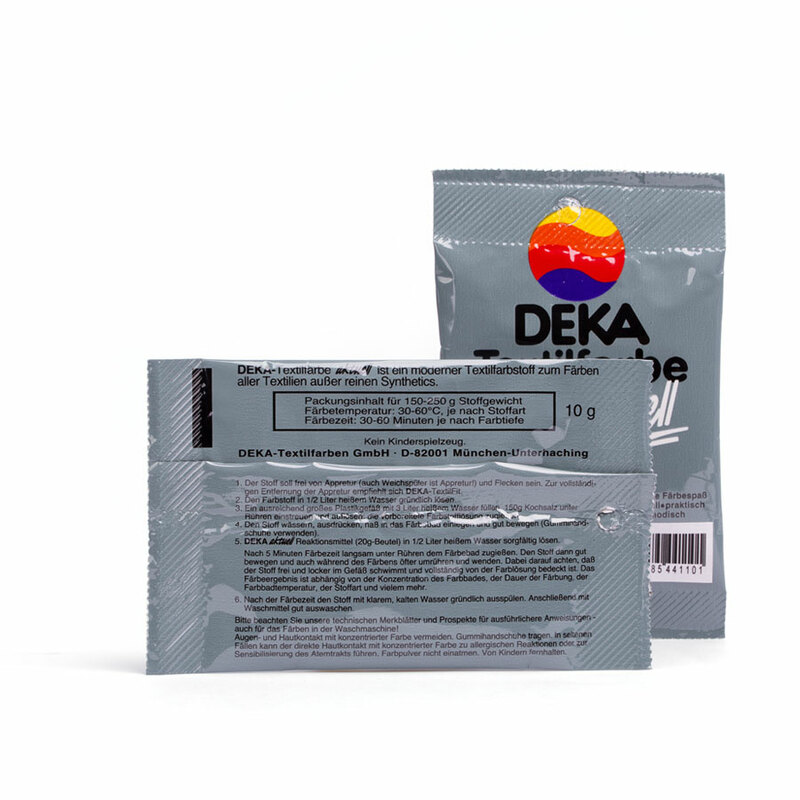 Customer review for "DEKA 'aktuell' Textile Powder Dye - 10g"
Nachdem ich zum ersten Mal gefärbt habe war ich so begeistert, dass dies mein neues Hobby wurde. Wenn man erst mal kapiert hat wie das Ganze funktioniert, dann ist es kinderleicht und die Farbgewalt ist einfach unglaublich. Mein Ausflug zu Simplicol hat mir gezeigt wie intensiv professionelle Farben sein können und wie mies diese Drogeriemarkt Marke ist. Die Simplicolfarben waschen sich schnell raus und sind nicht so leuchtend. 100 Sterne für diese Farbe ? Ich bin von der Leuchtkraft dieser Textilfarben sehr begeistert! Die Farbe ist einfach anzuwenden und löst sich nicht bei späteren Wäschen. Wir haben bei Patin A schöne Batik Farbe gekauft. 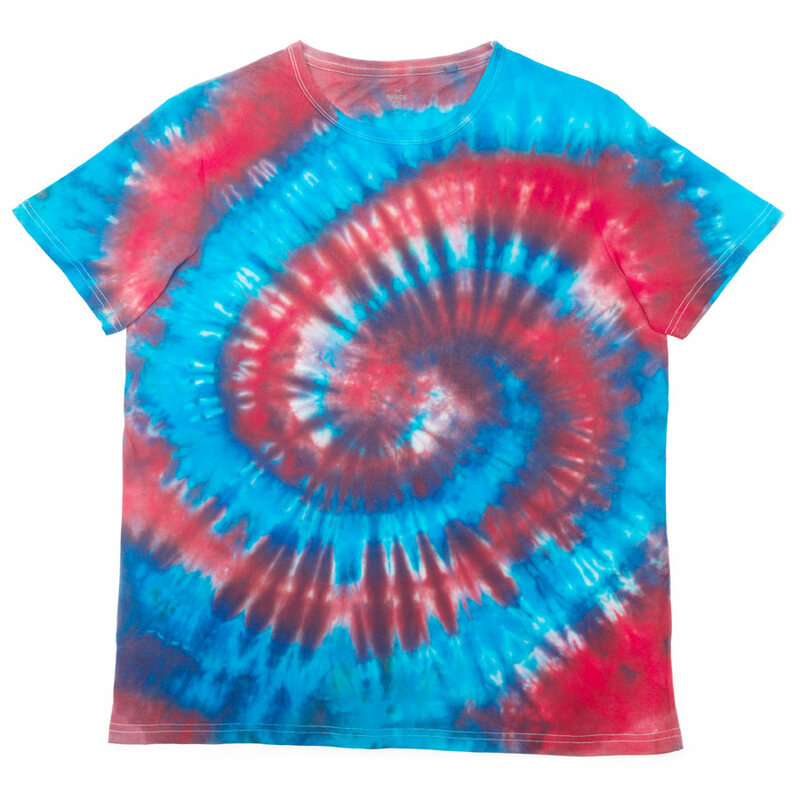 Die T-Shirts wurden mit der Tie Dye Technik gefärbt. Auf der Suche nach Farben und Anleitungen für Tie Deing bin ich auf diesen Shop gestoßen. Hier gibt es eine große Auswahl und viele tolle Anleitungen, Erklärungen, oder Inspirationen. Die Beschreibung zur Nutzung der Farben auf der homepage finde ich klasse sowie auch die Hinweise zur Verwendung als tie dye - Gestaltung. Werde ich demnächst auch mal ausprobieren. Tolle Farben! Wir haben sie zum batiken mit Kindern verwendet. Ein voller Erfolg! This ironing blanket lets you iron safely on any surface!